← Could HBO’s New Gay-Themed Show Be The Long Awaited Successor to Queer as Folk? Well, it’s only fitting that a disappointing season of American Idol that never quite fulfilled the potential promised by its talented performers end with a disappointing finale that didn’t show off those talented performers in their best light. I mean, sure, Candice Glover totally killed her reprise of “I Who Have Nothing,” and Kree Harrison once again slayed Patty Griffin’s “Up to the Mountain.” But the fact that the show, and the performance component of the season, ended with performances we’ve already seen indicates we’re long past this year’s peak. That peak certainly wasn’t scaled by Simon Fuller’s uninspired selections “Angel” and “Chasing Pavements,” which Kree and Candice, respectively, performed with loads of skill but not much passion. And in the post Phillip Phillips’ “Home” era, where we know that a coronation song is capable of capturing both a moment and a relevant musical trope, there’s no excuse for “I’m All Cried Out” and “I’m Beautiful.” Yes, these songs were better than some of the dreck finalists have been handed in years past (“This is My Now” was a particular low point), and the women sang them well, but it’s hard to imagine either tune getting serious radio airplay, let alone becoming an Olympic anthem. In my post yesterday weighing the factors that will contribute to who wins, I said it may just come down to what happens in the performance finale — who performed last and left the final impression; who had the better single; and who the judges threw their support behind. 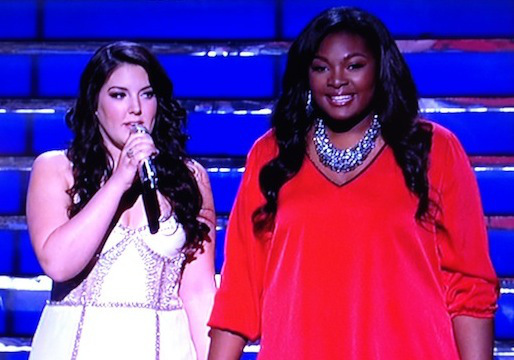 Now, having seen Candice and Kree’s final songs, I don’t know that the needle was moved very far in either direction. Kree won the coin toss and foolishly decided to sing first, allowing Candice to own the last vocal moments of the season, so give the point to Candice there. Kree’s single was slightly better than Candice’s, but only slightly, so I’ll give Kree a bit of an edge in that category. And with the strange decision to have the judges only intermittently give feedback, I don’t think it can be said they fully endorsed either contestant. To me, both women sounded great, as they always do, but Candice won the night by showing more vocal dynamics throughout her three songs. However, it wasn’t such a decisive knockout as to guarantee victory. Though she would get my vote, I’m going to stick to the instincts that drove the piece I wrote yesterday, and predict the intangibles (taste level, style of music, narrative arc) will lead Kree to a narrow victory. I think it may be the closest vote in years, and it truly could go either way, but that’s where I’d lay my bet. Who do you think will win and become the next American Idol, and why? Let me know! READ: Are Reality TV Results Shows About to Become Obsolete? This entry was posted in Television and tagged American Idol, Candice Glover, Kree Harrison. Bookmark the permalink. I feel that Candice will win, but I have split my votes pretty evenly in the last month because Kree has an amazing voice too, but she hasn’t performed the best songs in the last 4 weeks to show her versatility. The question of being versatile between Country, Blues and more has been dwindling with the more country tunes performed; whereas Candice has sung so many styles with excellence AND she has become more comfortable with commanding the stage. It also almost seems like the producers have favored her as well with the hair, makeup, jewelry and stage lighting, etc. We have been given a better glimpse of this woman looking like a glamorous star. And, with Kree… the trouble with being in one niche is that no matter how well they perform, the audience will lean towards the musical style they like better. Kree didn’t give us enough of non-country. Both ladies have hear-warming personalities and background, but I think Candice will have ‘the 3rd times’ the charm’ win AND the more universal audience appeal.